Every year as May approaches, I find myself in a vegetable conundrum. The many quarts of vegetables preserved from last year’s organic backyard garden have lasted through the long winter months, but are now almost gone. I can finally “play in the dirt” once again, my garden plot having lost its blanket of snow. Alas, while planting season is fun, it offers nothing to bring back from the garden to the kitchen. I’ll try to be patient for a few more weeks. Meanwhile, I Miss My Garden Sauce offers the next best thing… homemade flavor coaxed from wholesome, organic ingredients (even if they aren’t from my own backyard). This sauce offers a lot more nutrition than jarred spaghetti sauce, without any of the added sugar (Don’t believe me? Read the label on one of those jars at the supermarket.) 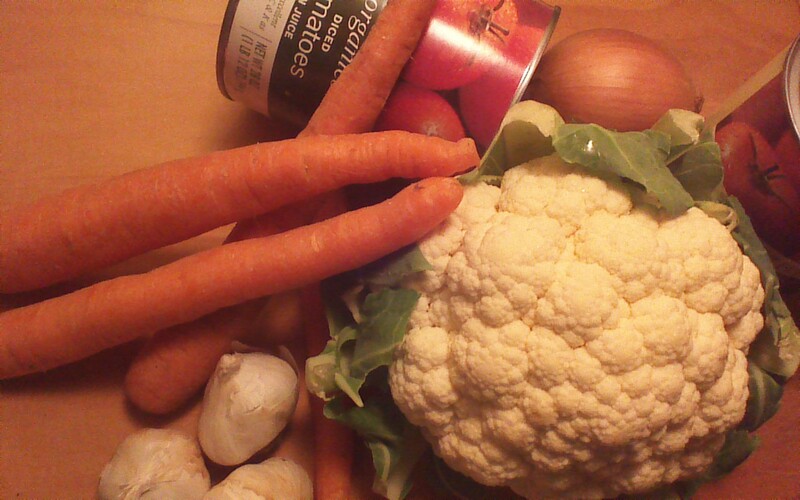 It’s also a FANTASTIC recipe for hiding vegetables that children (and some grown-ups!) think they don’t like. I won’t tell if you won’t tell. Have fun shopping for the best produce you can find for this recipe – finding quality organic items at the market is part of the fun, and the gentle growing practices of organic farming are beneficial for our Crowded Earth! 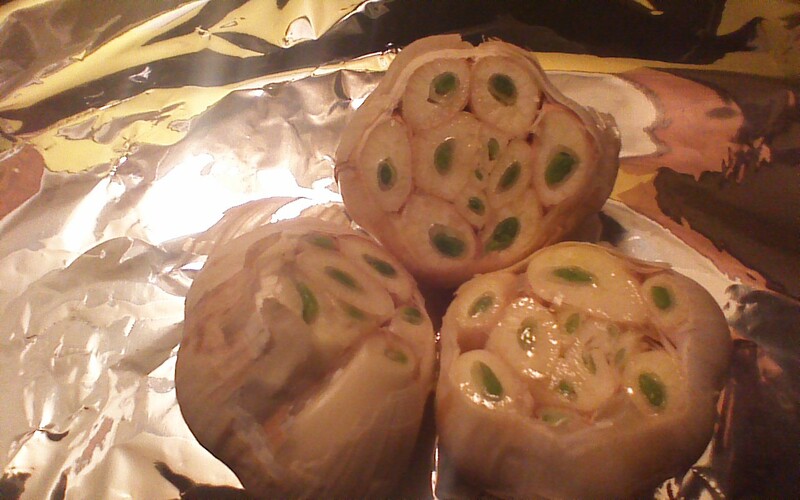 Step 1) Cut the tops off of each bulb of garlic as shown. 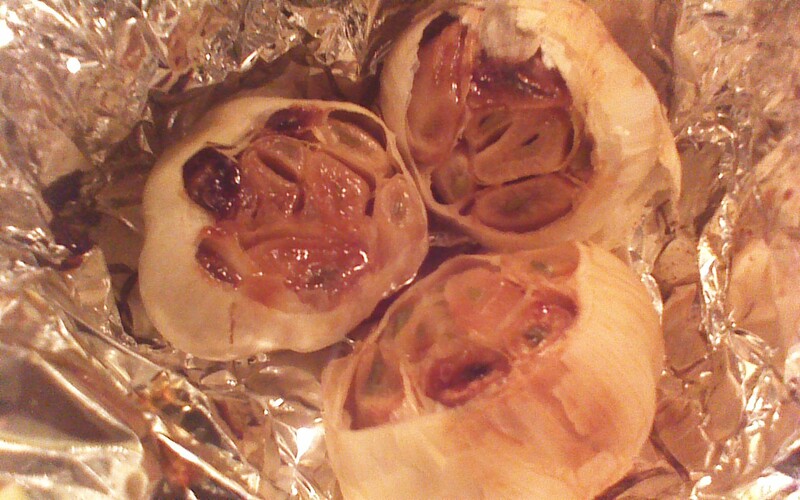 Place all three bulbs of garlic in the center of a large square of foil. Drizzle 1 tablespoon olive oil over the tops of the bulbs. Gather up the sides of the foil and pinch together above the garlic. Set aside. Step 2) Grease a large roasting pan with 1 tablespoon of olive oil. 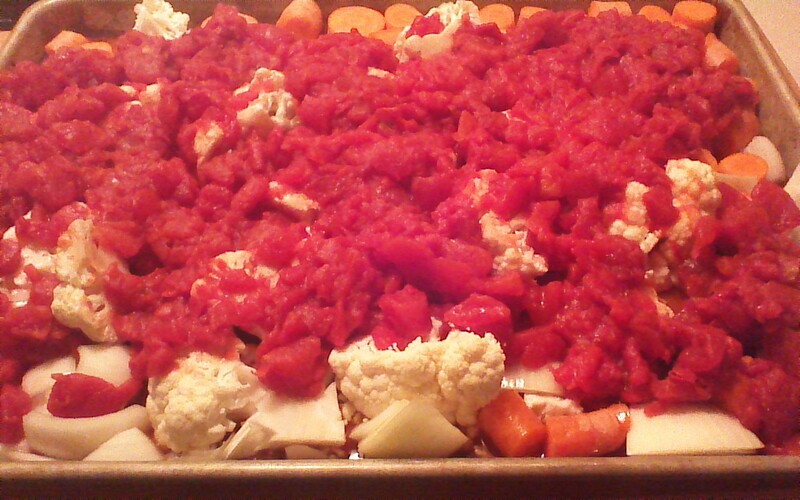 Chop cauliflower, carrots, and onion into bite-size chunks and place on roasting pan. Cover with both cans of tomatoes (including juice). Step 3) Place roasting pan and foil pack of garlic in oven, and roast at 400 degrees until vegetables are soft, approximately 45 minutes. It’s OK if the tops of a few veggies blacken, but be sure to stir the pan with a spatula once or twice to keep the bottom from sticking. Step 4) Transfer roasted vegetables to a large pot. 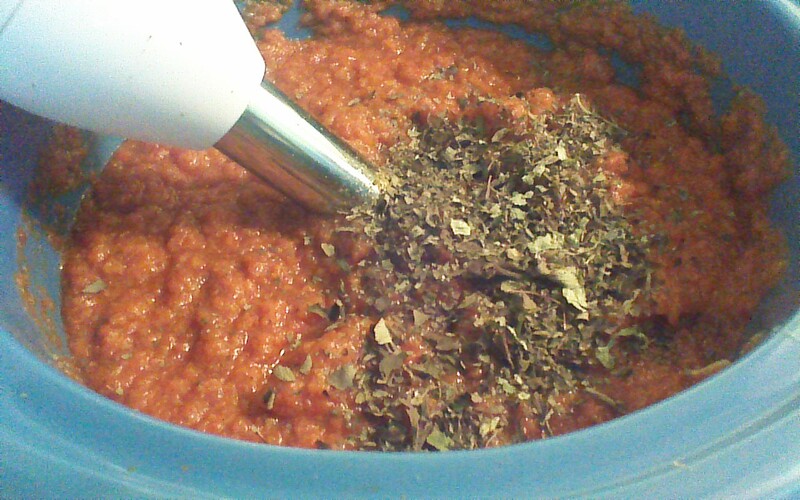 Step 6) Puree contents of pot with an immersion blender. Blend in oregano, basil, and pepper. That’s all – you’re done! 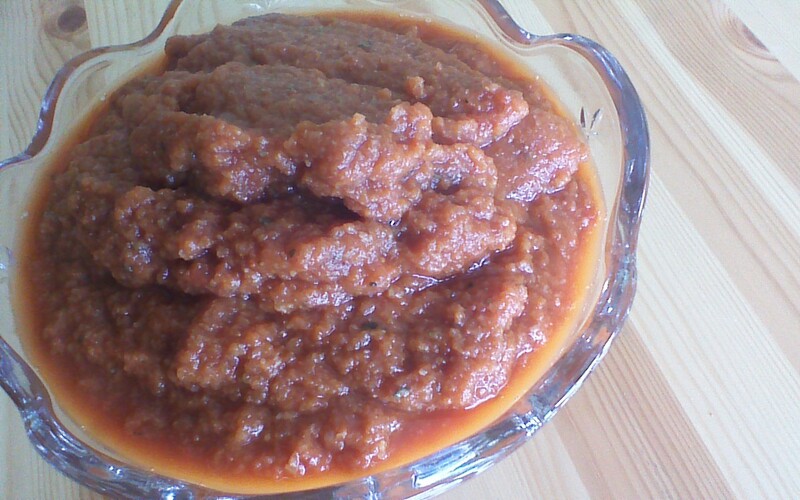 If the sauce is too thick for your liking, thin with a little bit of vegetable broth, chicken broth, or tomato juice. This sauce tastes even better if you allow the flavors to blend in the refrigerator for a day or two. Next up on Crowded Earth Kitchen, we’ll make fabulous meatballs to enjoy with this sauce. Stay tuned! This was fun, but I still miss my garden. 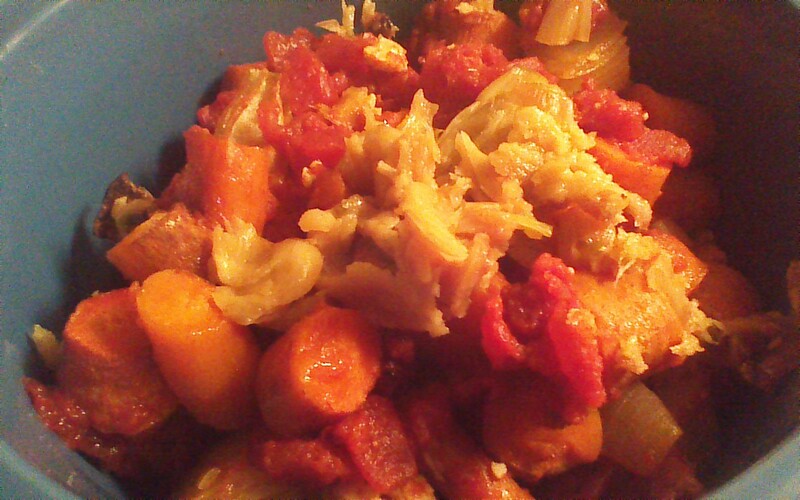 This entry was posted in Fruits and Veggies, Main Dishes, Vegan, Vegetarian and tagged carrots, Cauliflower, roasted garlic, spaghetti sauce, tomato sauce. Bookmark the permalink. Sounds healthy and hearty, am definitely trying this TONIGHT! Fabulous – I hope you enjoy it!